Changing your office layout may appear to be difficult and expensive. However, simple changes can enhance corporate culture and employee productivity. 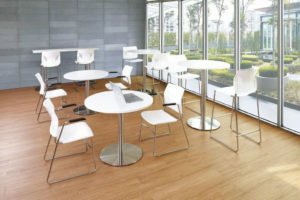 For example, start-up companies can benefit from utilizing standing cafe tables and couches. Fortunately, at Source Office Furnishings we offer a selection of bistro tables that offer flexibility and function, ideal for start-up environments. Recharge rooms, which are spaces for employees to have quiet time and relax are another new office trend. With this in mind, converting break rooms or conference rooms into recharge spaces is easy. To accomplish this, just add elements to make employees feel comfortable, such as bean bag chairs. Additionally, a simple way to create a fresh office space is to add company colours throughout the office. Some suggestions are painting an accent wall or adding coloured pieces of furniture. Have you had a chance to check out Source on Instagram? 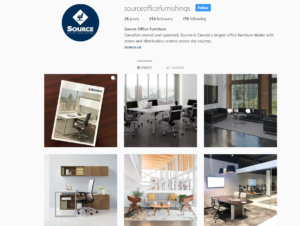 Follow us at @sourceofficefurnishings for design inspiration, featured products, and stunning office layouts. If you create an office space using Source furniture, we would love to see it! Tag us in your posts for a chance to be featured on our account. A great way to transform any office is to freshen up the reception area. Create an inspiring and comfortable entrance space with Source’s Brighton Modular Reception Seating. Dream, design, and discover the perfect modern space with endless configurations. Brighton’s clean, modular pieces include a club chair, right or left single-arm, and armless components. However, we recognize creating an inspiring office layout can be intimidating. Let us do the planning for you with our office space planning and design services. Source’s space planning specialists help you through the process and allow your business to get the most out of its office furniture. Visit source.ca today to find the store closest to you, and discover a unique office layout that will inspire your employees.